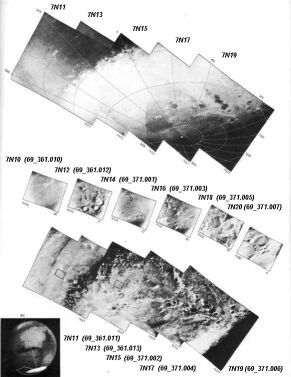 Software for Mariner 6&7 TV experiment. 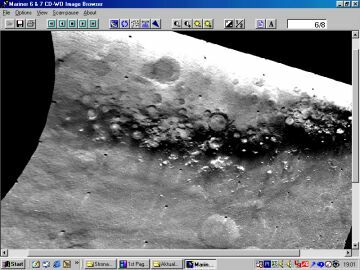 Program Mariner6&7View is created for M69_2001 CD-WO volumes produced by the Science Digital Data Preservation Task. 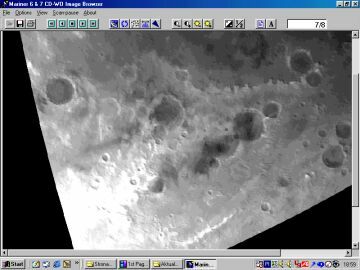 This data set has been generated by the Jet Propulsion Laboratory's (JPL) Science Digital Data Preservation Task (SDDPT) by migrating valuable space science data from older, deteriorating magnetic tapes to CD-ROM. The primary goal of the SDDPT is to reduce the amount of data stored on magnetic tapes, preserve valuable science data and make it more accessible to the user. 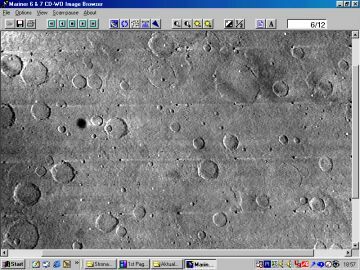 This data set (69-030A-0019) resides on a CD-ROM volume and contains Mariner 6 & 7 TV Reduced Data Records. The input for the compact disc was magnetic tape that, in most cases, was at least 20-27 years old. Accompanying each tape on the disc, there is a log file which documents SDDPT processing history. Therefore, if problems were encountered while recovering the data from tape, they will be documented in the log file. (The SDDPT is not reformatting the data). However, it has been made readable in standard ISO 9660 format on the compact disc useable on a variety of platforms. This data set is available from National Space Science Data Center (NSSDC). 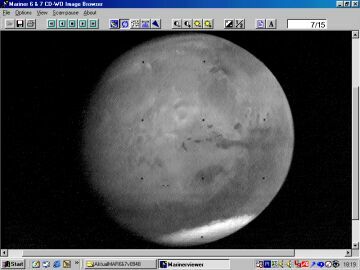 Mariner6&7View is a Windows viewer for this data set. 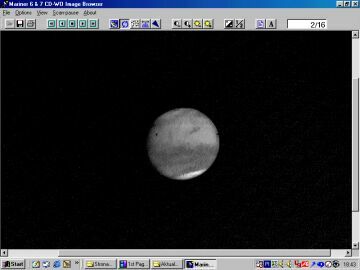 Mariner 6 and 7 far encounter. 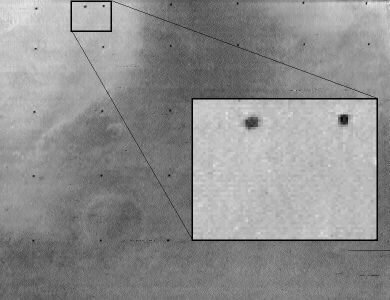 Mariner 6 and Mariner 7 near encounter. 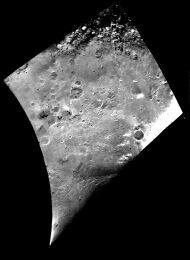 Mariner 7 Images processed by JPL. 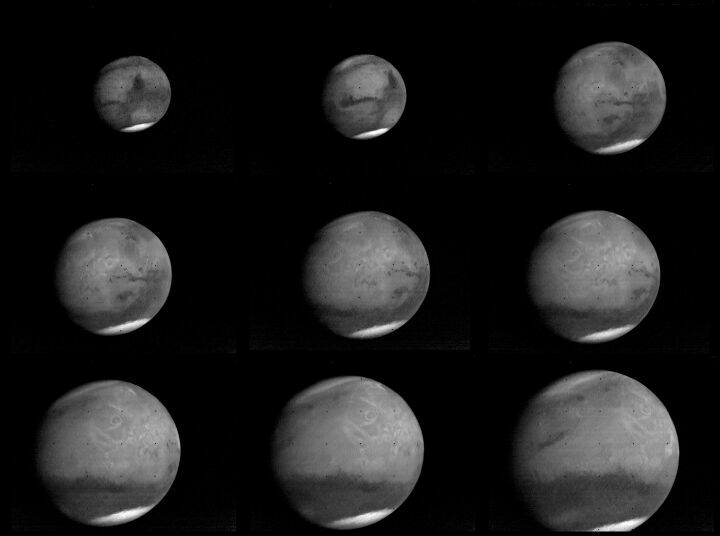 Images reconstructed by JPL/IPL from the three data streams (CAV, DV, and ETE). and by an IBM 360/75 for noise removal in 1969 (enhancement program by Earl B. Sundquist). 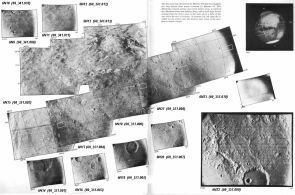 Images in orthographic projection processed by JPL/IPL in 1969.
in language called MAP (macro assembler). The input data for this CD volume were originally archived on 7-track magnetic tapes and contained Mariner 6 & 7 TV Reduced Data Records. The 7-track data in this dataset was padded. The 6 bit characters were padded to 8 bits by placing zeroes into the 2 high order bits. The 7-track tape data was originally written in "SNAKED" format with attached EBCDIC VICAR labels in front of the data. 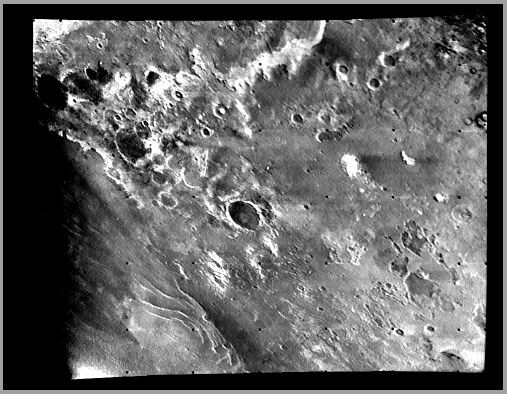 Image 6N21 includes the boundary between dark Sabaeus Sinus and light Deucalionis Regio. 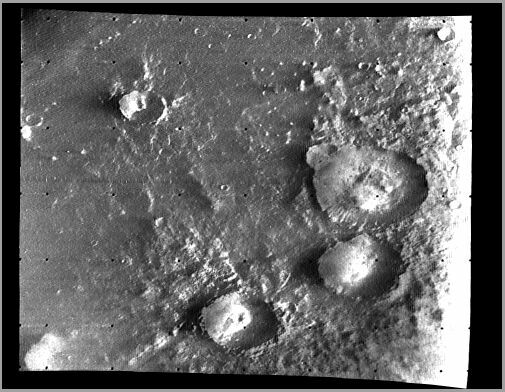 Careful crater counts in both regions indicate there is no significant difference between crater distributions in light and dark areas. Data errors and problems information. 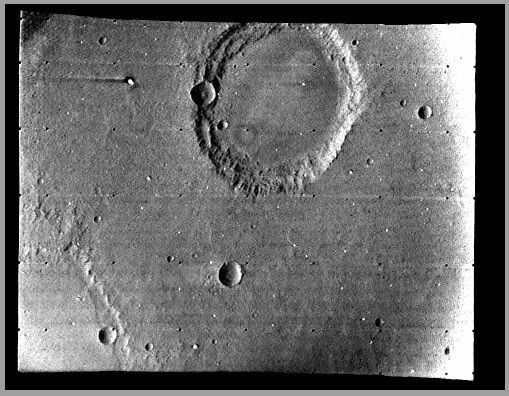 Image 6N18 contains in the lower left the edge of what is apparently a large, nearly obliterated "ghost" crater. While the prominent crater in the upper middle of 6N18 may be easily identified in 6N17, this larger "ghost" crater edge is not apparent in the 6N17 frame. Image 7N17 includes the actual South Pole near the lower left corner of the picture. 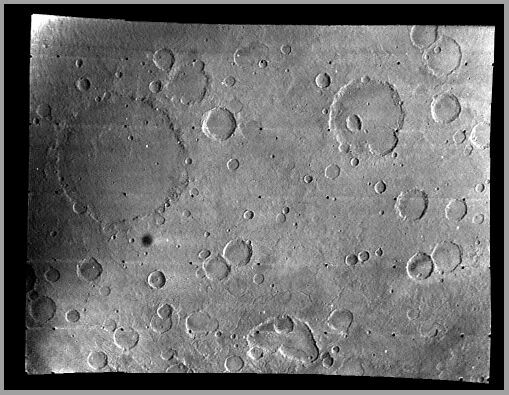 In the vicinity of the Pole there is a noticeable lack of craters and other features common elsewhere on the Polar Cap. Notice, also, the alignment of curved streaks around the Pole. 3) Movement data inside line. Image 7N12 is a deceptive telephoto view of the cap edge. Since the sunlight is coming from the left side of the frame, what appear to be shadowed crater walls are, in fact, the sunlit slopes from which the snow has been melted or sublimated by the direct sunlight. 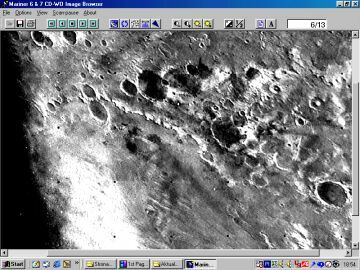 The bright slopes of the craters are the areas inclined away from the Sun where snow still remains. Recommended tapes (folders on M69_2001 CD-WO). The small, dark spot near the top of 7F91 over the desert Aeria just west of Syrtis Major is Phobos, one orbit after it appeared in 7F79. 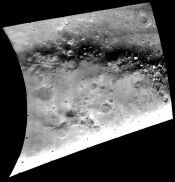 This image of Phobos covers about 40 picture elements. From this data, Phobos was found to be an oval object approximately 22.5 kilometers long and 17.5 kilometers wide. Also, it was concluded that Phobos is a very dark object.